Last year, I tested the C.T. Fischer Nessmuk knife, and liked it so much I got one of his four-inch Bushcraft knives. I haven’t needed a knife in many years, but the Fischer’s catalog photos showed a knife I really wanted. It all has to do with feel. I hunt squirrels, rabbits and other small game with Annabelle, a handmade .40 caliber flintlock muzzle loading Pennsylvania rifle. Annabelle has a custom-made, gorgeous curly maple, full length stock. In 2003, the late Jim Grenfell made me a tomahawk, with a curly maple handle to match. All I needed was the right knife, and I would have the quintessential eastern long hunter setup. I saw the knife I was looking for in the C.T. Fischer catalog. C.T. Fischer Knives are based in Elk City, Idaho, and knifemaker Christopher T. Fischer hand makes his cutlery one item at a time. The knife I wanted was the four-inch, full tang Bushcraft knife, and it bore a striking resemblance to a Mora. The knife handle could be made of a variety of different materials. Yes, he had some curly maple, Fischer said, and a deal was struck. The waiting list for Fischer knives can be a few weeks or months, and finally, my Bushcraft knife arrived. I immediately took out the rifle and tomahawk, and the knife matched almost exactly. The handle fits like it was made for my hand, and the finish, wood fit and shape of the blade were just what I was looking for. But I won’t carry any piece of equipment that hasn’t been proven, so I started testing it. The quality of Fischer’s steel was a given after I wrung out the Nessmuk, so I didn’t do any outright abuse to the Bushcraft knife. Fischer hand makes a variety of knives made out of used circular saw blades that formerly saw duty in a lumber mill. Fischer knives are shaped by grinding, and he didn’t do any additional tempering on my Nessmuk. Since last year, though, Fischer has perfected a new heat treating method that he claims makes the steel even better for blades. My knife testing is a lengthy process. All of them start out in the kitchen. The knife is used at every opportunity, to evaluate how the blade and handle work for different common tasks. Then, I’ll find some lengthy cutting job, to test the handle design. I cleaned a few fish, peeled some potatoes and carved some meat. The knife did just fine, even though it wasn’t the best for all those tasks. The Bushcraft knife comes with a custom leather sheath. Once the knife passed the kitchen test, it went outdoors. I didn’t baton (pound the knife through a piece of firewood to make kindling) with it. I don’t believe this test proves much about blade quality. With the right technique and piece of wood, you can split kindling with a butter knife. But I did I cut up a bunch of jute twine, cut up a bunch of cardboard (which is a real test of edge-holding), and whittled a bunch of sticks for starting fires. Since hunting season isn’t for several months, I had to postpone actual hunting field use. The blade held its edge, though the cardboard finally dulled it. A few swipes with my butchering steel returned it to shaving sharp. The Bushcraft knife comes with a Scandinavian bevel edge to it, so sharpening is a snap. Mostly what I did though, was carry it on a daily basis. The sheath is a fine piece of leather work, and secures the knife well. The only addition I made was to put a brass D-ring in the belt loop, so I could attach the knife to a belt key holder or the outside of my pack. The Bushcraft also rode to the office in my briefcase, where it was used for letter opening, slicing bagels and spreading peanut butter. In the field and in the office, the Bushcraft did every task required of it. 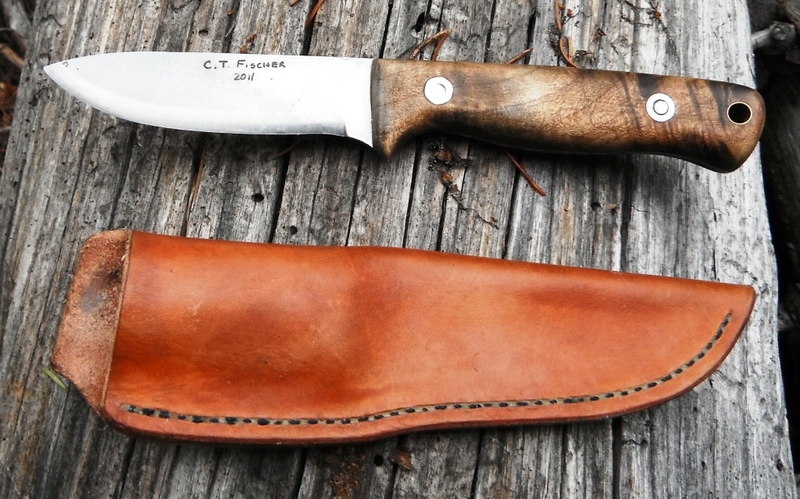 The four-inch Bushcraft, with custom leather sheath, retails for $199, which I think is a steal for a product hand-made of local materials by an American craftsman. While you can buy cheaper, mass-produced knives, it would be hard to find a better one than the four-inch Bushcraft. Look at it this way: Every cutlery enthusiast can afford a few nice knives, the ones that you enjoy looking at as well as using. The good knives will last forever and be passed down to kids and grandchildren. For more information and to view the C.T. Fischer knives website, click here. 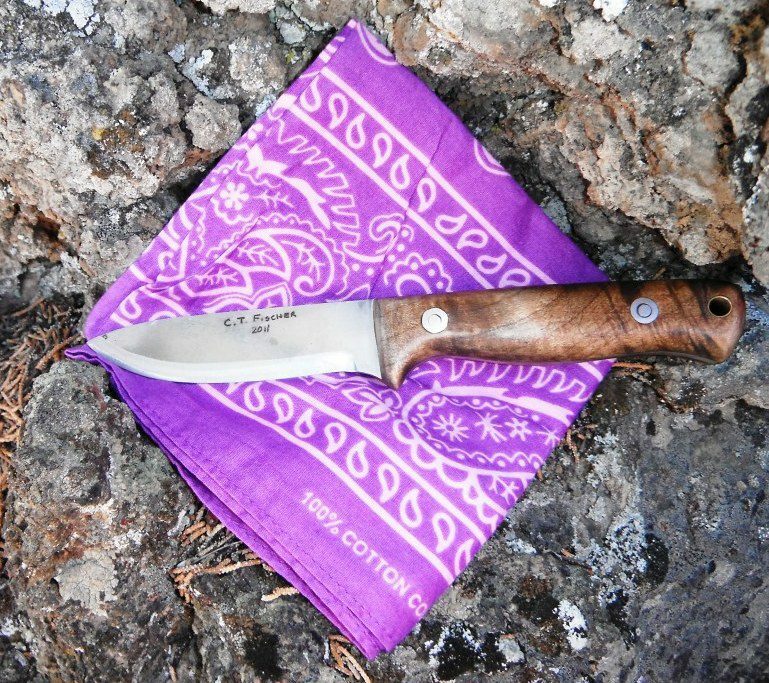 For more information about survival and backcountry knives, click here! 1 Comment on "Review: C.T. 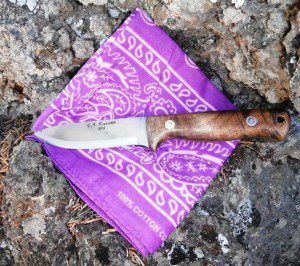 Fischer Four-Inch Bushcraft custom knife"
According to Christopher Fischer: This knife (the four-inch Bushcraft), with the Rc. 58 heat-treat, is $150, rather than $199. At the 45 Rc. hardness, it is $125.